I was pleased to reacquaint myself with this parasitic plant the other week at Mount Usher. It is not in the garden here but it did (and probably still does) grow at Myddelton House in north London. 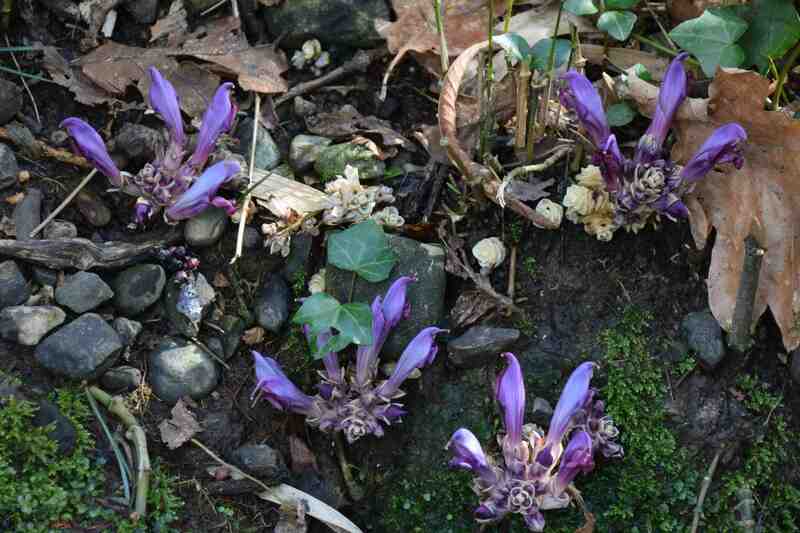 Parasitic plants are not common in gardens, possibly because people just don’t like the idea of them and partly because they are slow and imprecise to cultivate – plus you need a host plant established to stand any chance of it growing. Lathraea clandestina is the most commonly cultivated parasite because of its colourful flowers that appear in spring and look like purple crocus at first glance and it is hardy and has a wide host range. It is native to south and west Europe and can invade the roots of alnus, corylus, populus and salix among others. After flowering the large seeds are expelled from the white, scale like clusters to spread the plant. The seeds germinate and form roots that explore the soil until they reach a host root and invade it. The plant then gets all the nutrients it needs from the host plant and forms rhizomes through the soil near the surface. 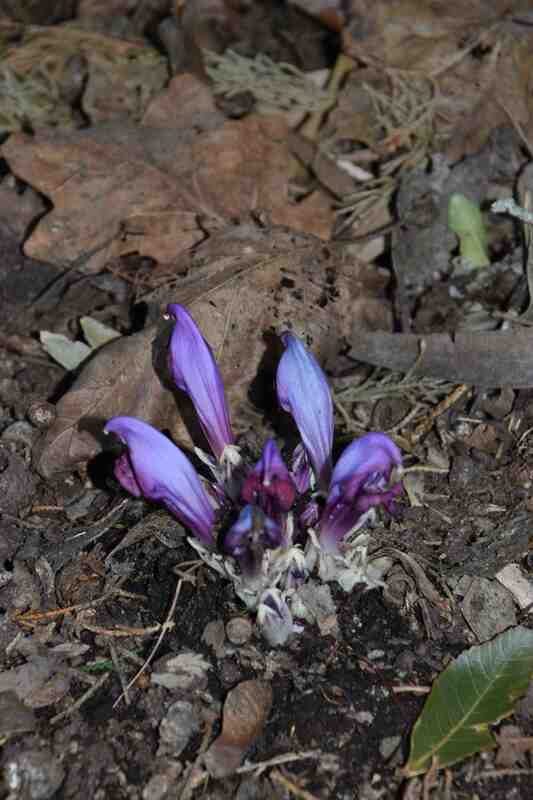 Apparently it is possible to establish plants by digging up pieces of the rhizome and placing them near the host root though I would have though that cutting or wounding the root may help the lathraea find its host. In any case it will take many years, from seed or plant piece, for it to establish and start blooming. Lathraea clandestina is most commonly found in moist soils, which is, coincidentally, where its host plants most commonly grow, but it will flower in even the deepest shade because it needs no light to grow and has no leaves or green pigment. In most seasons the flowers open over several months so it can be a valuable garden plant and the 50mm flowers are pollinated by bumble bees. Although these clusters of flowers are rather sparse, in some conditions the ground can be almost covered with the purple flowers. It is apparently naturalised in some parts of the UK, mainly in the south. I am not sure if it is growing wild here in Ireland but it is not inconceivable that its seeds have popped beyond garden boundaries. I used to have a friend who had sheets of this lovely plant. You never find it for sale anywhere. I went to Myddleton House last week but didn’ t see any. Two things I did see there which I covet are Eleagnus multiflora ( smothered in fragrant flowers) and Staphylea colchica; gorgeous.